This spring has been a busy and active time with my project traveling back to Houston again, then Charleston, Pittsburgh and back to Tallahassee. Please accept my gratitude in helping me with holding my hand along the way. Have a warm and delicious summer and enjoy! Touch in Real Time: A Project of the SensesWhat’s new and why….. I have held hands with hundreds of people from Arizona to Maine. The clay imprints are now fired and will last forever as artifacts between you and I. 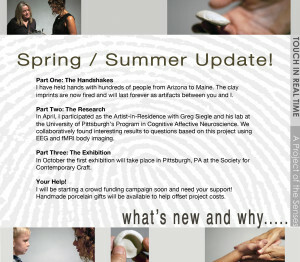 In April, I participated as Artist-in-Residence with Gred Siegle and his lab at the University of Pittsburgh’s Program in Cognitive Affective Neuroscience. We collaboratively found interesting results to questions based on this project using EEG and fMRI body imaging. In October the first exhibition will take place in Pittsburgh, PA at the Society for Contemporary Craft. I will be starting a crowd funding campaign soon and need your support! Handmade porcelain gifts will be available to help offset project costs.